The OkiData CX2032 MFP is an all-in-one unit capable of handling both black and white and color documents and high paper throughput. It features acceptable printing speeds, fairly high resolutions, and is relatively small and lightweight for an all-in-one unit, making it potentially ideal for small offices. 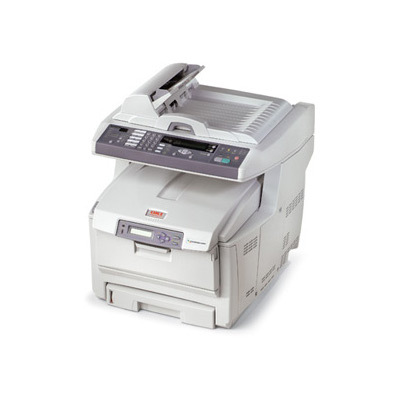 The CX2032 MFP measures 19.7" by 23.6" by 26.4" and weighs 81.6 lbs, well under the sizes of other all-in-ones with larger paper inputs and outputs. However, the printer has a standard input of 400 sheets and an optional second tray expands this to 930 sheets, almost two reams of paper. The MFP prints 32 pages per minute in black and white and 20 pages per minute in color, both of which are above standard. Documents can be printed at a maximum print resolution of 1200 by 600 dpi. The printer can interface with systems either via USB 2.0 or 10/100Base-T Ethernet, making it easily networked or connected to individual systems if necessary. A 40GB hard drive is available as an add-on, as is a 500-sheet second paper tray, and a duplexing unit. The printer normally includes one 256 MB DIMM, which can be expanded up to 768 MB of RAM. The CX2032 can produce both black and white and color copiers at speeds of 32 pages per minute for black and 20 pages per minute in color. It supports a maximum resolution of 600 by 600 dpi and can enlarge or reduce images between the sizes of 25% and 400% in 1% increments, as well as produce a maximum number of 99 copies at one time. The CX2032 produces scans in both color and black and white at speeds up 3 seconds per page in black and white and 6 seconds per page in color at a maximum resolution of 4800 dpi. It supports scan-to-email without a PC to improve efficiency, scan-to-FTP, CIFS, and TWAIN, and can produce images in BMP, PDF, TIFF, and JPEG from the scanner. The scanner's automatic document feeder can handle up to 50 letter or legal-sized sheets at a time and larger documents can be scanned on the flatbed. The CX2032's fax unit transmits at a maximum speed of 3 seconds per page across a 33.6kbps modem and at a maximum resolution of 200 by 400 dpi. It has 1.5 MB of fax memory to store 100 pages and supports broadcasting up to 100 locations and 20 groups, as well as delayed transmission, speed dial, auto redial, and send/receive activity reports. The CX2032 can handle standard paper sizes Letter, Legal, Banner, Executive, A4, A5, B5, and A6, as well as envelopes rated at C5, DL, Monarch, COM 9, or COM 10. It will also process custom-sized paper between 4.1" by 5.8" to 8.5" by 14" in its main tray and 3" by 5" to 8.5" by 47.24" on its multi-purpose tray. Drivers for this printer in Mac OS X have not yet been rewritten for Mac OS X 10.6 Snow Leopard, and on 64-bit systems users will need to run software from which they print documents in 32-bit mode in order to take advantage of all functionality built into the CX2032's print driver. Additionally, OS X users will need to install Rosetta to interface with the printer, which will occupy substantial hard drive space for users who don't already have it installed. Review it: "OkiData CX2032 MFP "
The CX2032 requires four toner cartridges and four drum units, one each for cyan, magenta, yellow, and black. 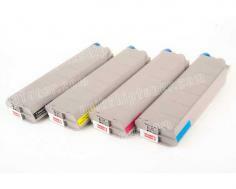 The printer ships with cartridges rated at 2000 pages each at 5% coverage. Replacement cyan, magenta, and yellow toner cartridges are all rated at 5000 documents each at 5% coverage, and the black cartridge is rated at 6000 pages at 5% coverage. 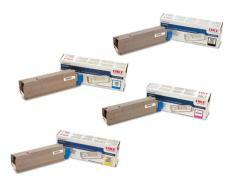 All four drum units require replacement after 20000 pages at approximately 5% coverage. Because the toner and drum units are separate, the printer will require additional maintenance to maintain function, but overall costs for replacement go down.